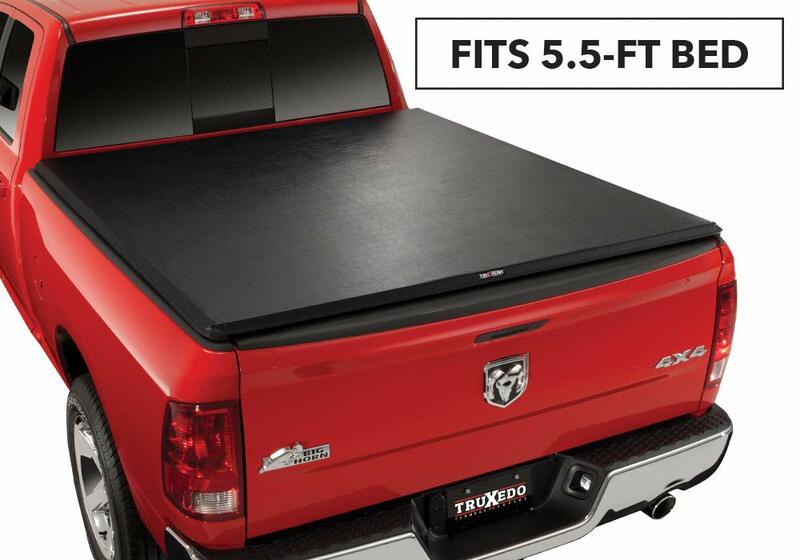 Best Tonneau Cover for Ram 1500 Reviews: Top-5 in April 2019! Its time to cover up that truck bed and you don’t know which way to go, no problems. That’s why I am here to help you diced what would suit your Ram 1500 bed cover. 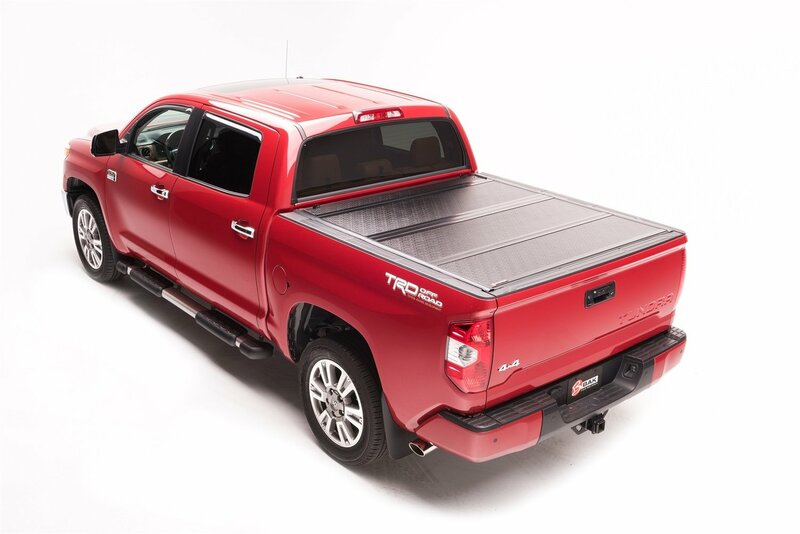 Tonneau covers are not just for covering and securing your cargo, they have been proven to provide less wind resistance, as such they reduce your MPG and raise your fuel savings to 10% in some instances. 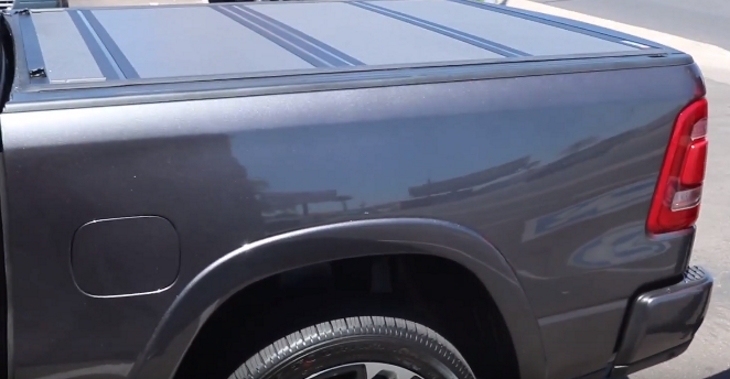 How to Choose A Tonneau Cover for Ram 1500? The TruXedo TruXport 245901 TruXport is a soft top roll-up truck bed cover. The 245901 model is a 1.5” mounted design that sits on top of the bed and connects to bed rails. This model is made of a Leather Grain Fabric that is designed to withstand the harshest of weather conditions. The system comes with a Pre-Set Tension Control that is integrated into a dual latching system. This control keeps the cover tight and looking good all year round. The operation is easy too; there are dual paddle latches on both sides of the bed, so rolling is not an issue. This is a budget-friendly model and is very easy to install. It retains its looks all year round especially if you keep it clean and maintain it properly. 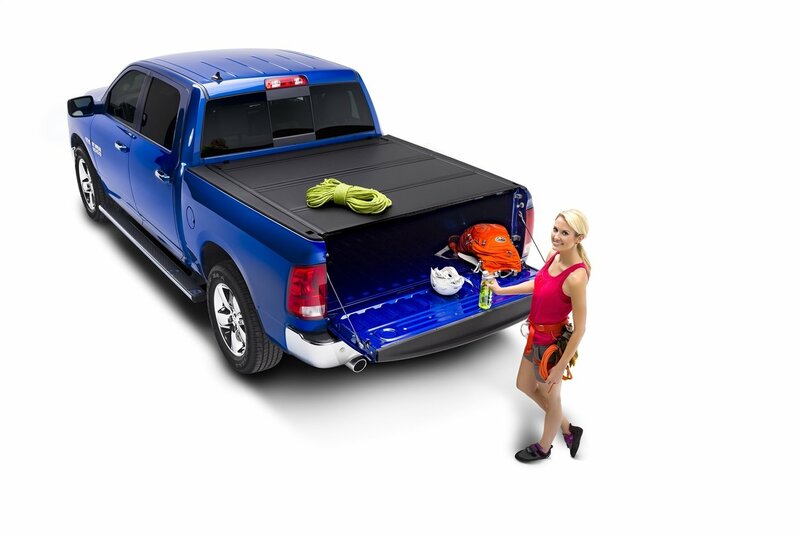 This is the soft Tonno Pro Tonno Fold Tri-folding Tonneau Cover. A classic three section cover that comes in soft marine grade vinyl. This easy to install and use cover will take you only 10 minutes to install. Once in place, the soft yet rugged material will provide you with a three-section folding option that will handle any sized cargo. This model uses snap clip style fasteners for safe and easy storage in the open position. The slide lock design is patented, and you get an E-Z clamping system that provides the necessary tension and security. You also get a Q-seal gasket to protect your bed from wet weather conditions, which is enhanced with a front flap. 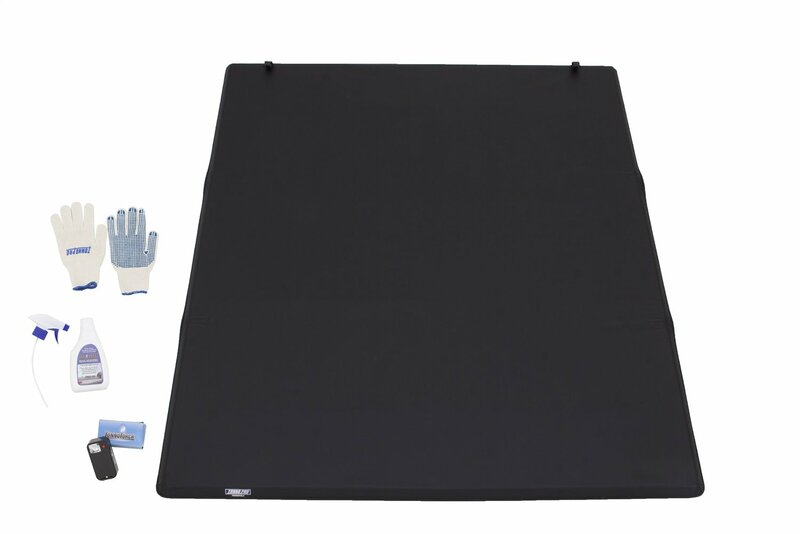 This is the low-cost tonneau cover from Tonno Pro, it’s a soft yet durable Vinyl that clamps onto your bed very easily, and the price is exceptional for the quality you get. This is the BAKFlip MX4 heavy duty hard Tri-panel hardcover. The BAKFlip MX4 comes with a heavy-duty aluminum alloy with matte finish panels. Thee are exceptional for total security and protection from every possible natural element and road or off-road condition. The MX4 is the BAKFlip upgrade from the G2 Aluminum series, and you get upgraded latch housing components, as well as their all-new integrated tailgate seal. This seal can close whether the cover is up or down. The MX4 is an extreme condition tonneau cover; the aluminum is corrosion resistant, a 100% UV blocking material, and designed to deliver extreme MPG savings. This is a premium grade tonneau cover, and its price is in accordance with the level of engineering and design. As such, this will cost you more than triple the cost of most covers and is made for only professional truck drivers that need extra protection and security for their loads. The Switchblade is designed to install quickly and operate even faster. All you need to install this model is a 7/16” wrench and a Philipps screwdriver, and there is no drilling required. This retractable model is a hardcover version; each slat is made from a rugged aluminum alloy that is covered by their proprietary ArmorTek overlay that provides extra protection from the weather. The canister is compact too, and it doesn’t take up much space as most other retractable canister units. The slats provide channels for the water to flow off the surface, so your top is always waterlogging free. The canister uses an integrated Continuous Tension Spring which maintains a constant hold that provides easy retraction and traction as well as a “hard surface” look and feel. To operate the unit you have pull straps that remove the need to climb into the bed or walk around the vehicle. This is another high-grade model that comes priced accordingly. You won’t be upset by burning a hole in your pocket with this one since the retraction system, combined with the hard aluminum slat cover deliver a near perfect solution for your bed cover and security. This is the BAKFlip G2 solid tri-fold tonneau cover. Of all the BAKFlip products, the G2 is by far the most popular and best selling. This is a classic aluminum last tri-folding system that is designed to protect your cargo from the natural elements as well as secure them from theft. The G2 comes with a patented concealed latch system that is located under the tonneau cover and secures the cover to the tailgate. Since this is a tri-fold model, you get to control the sections that are open and will protect the remaining cargo from any natural damage. This is also upgradeable to the BAKFlip MX model that was reviewed above. A great unit, with a high price to pay for the perfection it provides. This model not only protects your contents and cargo, but it also reduces the vehicles MPG. These are the most popular covers, and you will find many different options available in folding form. The most popular of the folding category is the tri-fold, which enables the owner to fold the cover in three separates yet connected sections. Some covers come as bi-fold, and there is also quad fold. Folding covers give you the added benefit of opening up the back in sections, this way, of your bed is organized, you don’t need to open up the whole cover. A folding tonneau cover is perfect for covering sections of the bed that have different sized components that would not fit under a single hinged cover. These covers provide similar performance to folding tonneau covers, but their mechanism is different and more precise since you can roll back as much or as little of the cover as needed per application. A roll-up cover allows you to cover part of the bed and enables you to carry large cargo that cannot be covered while protecting the rest of the content. They are usually made of a soft material, but there are also hard metal slat options too. These are roll-up covers that come with an automated retraction system and cylinder. As such, you don’t need to roll them manually, you can just unhinge the cover, and it retracts automatically. They are identical in performance to the roll up, so you get the same level of accuracy, but with an automated retraction mode. These are single unit covers that come with a hinge for lifting the entire cover over the bed. These units do not fold or roll. They can be locked in a variety of angles, dependent on the hinge mechanism capabilities, and some hinged models came with pistons for automated and secured raising and lowering of the cover. Some hinged covers come with hard surfaces that are given painted designs to match the vehicles body paint. Hinged covers are for hauling small sized cargo that does not go above the bed height. These are usually soft covers (but there are hard versions too) that come with snap rails. You need to apply the rails then you can snap on the cover. They also proved you with the ability to open and close sections of the bed for different sized cargo. When buying a tonneau cover, you need to check to see how it can be locked and secured, some covers cannot be locked, but they can be secured, such as the snap on. However, the four other models can be locked, and you want to check that option before buying. Hardcovers will not give you the ability to cover differently sized cargoes, but they are structurally stronger than soft covers and resist rain and damage better than soft covers. The decision to buy a soft or hardcover is objective, its based on your cargo hold requirements. Hardcovers also provide less drag than soft covers, so you get a much better fuel efficiency result when using one. It provides safety and protection to your cargo; it also secures it during transport so that it won’t fall out and damage other drivers, or get damaged. It protects your cargo from theft when locked properly and it protects your cargo from the natural elements. A properly designed tonneau will reduce wind drag and increase fuel performance, as such you can gain up to 10% efficiency in MPG, thereby reducing your fuel bills accordingly. A good tonneau cover that costs a top dollar will recover the cost within 1 year for extensive use. A tonneau cover helps organize the contents since you will need to access some of the cargo constantly, while others less frequently. As such, arranging your cargo to meet use is an advantage that speeds up your daily routine, and makes it easier to find everything. The bottom line is that a good Tonneau cover saves money and time. It secures your cargo from theft, secures your cargo from natural weather damage and secures your cargo from ”jumping” out while transporting over rough terrains. It also secures loos grain from flying off the back and obstructing other drivers.